At least four people were killed and another six injured after a suicide bomber targeted a convoy of security forces in Kabul early Tuesday, officials said, in the latest bloody Taliban-claimed attack in the Afghan capital. 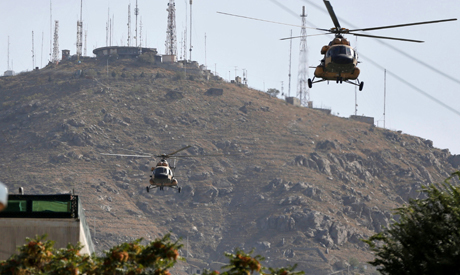 The blast took place in Paghman district in western Kabul as the convoy was returning from an overnight operation, interior ministry spokesman Najib Danish told AFP. "It is still not clear whether the attacker was on foot or driving a vehicle," the spokesman added. Another security official requesting anonymity said the assailant had used a car bomb to target the convoy. In November President Ashraf Ghani said nearly 30,000 Afghan soldiers and police officers have been killed since 2015 -- a figure far higher than anything previously acknowledged. Earlier this month, Lieutenant General Kenneth McKenzie -- who has been nominated to lead the US military's Central Command -- said the death rate among Afghan forces will no longer be sustainable unless urgent measures are taken to address recruiting and training issues. US envoy Zalmay Khalilzad -- who is currently canvassing the region to rustle up support for potential peace talks -- expressed hopes that a deal to end the war could be struck before the Afghan presidential election scheduled for April.